These words taken from Jeremiah 18, 1-6, are the appropriate words which suit not just the religious connotations of the potter but also proclaim the art of the potter as a creative act “alive to the concreteness of a moment”. Clay is one of the “materials of the moment” and embraces emotion and spirit. All work concerns spirit and soul and involves our ability to connect them with surface realities. The work of George Muscat expresses these qualities. George Muscat is one of the most talented ceramic-sculptors in Malta. We all know that he first started as an enthusiastic potter on the wheel and later, immersed himself in experimentation with various ceramic methods and techniques. We can say that his latest creative techniques in the art of clay have reached a high level of aesthetic value. When following George Muscat’s work throughout the years, one can see changes in techniques, forms, firings and glazes. I first noted his early Raku pieces in his last personal exhibition at the Razzett L-Antik Restaurant in Qormi, in January 2005. Today he mostly creates hanging pieces and murals utilizing the Raku technique, while his sculptures are mostly fired in stoneware temperatures and comprise a variety of glazes specially prepared for his work. One must not forget that today, Muscat uses other material like stainless steel, iron, glass and wood to enhance his creations in ceramics. In recent years the artist created a body of work of ceramic abstract sculptures; wall plaques and free-standing. I call this work, “metaphors in clay” because in my opinion his ceramic sculptures are the synthesis of his emotional passage materialised in space. Muscat observes and contemplates, remembers and anticipates and projects, memories, dreams and visions unto the clay. In this collection, his abstract pieces convey an array of emotions to the viewers: joy, happiness, sadness, fear, pain and other human conditions. His ceramics have great symbolic content. When we look at Muscat’s ceramic sculptures from a distance, we notice that they possess an insistent profile and reductive forms; images of simplicity and stillness. But when we take a closer look we encounter a sense of history, traces of transformation that generate narratives of accretion and deterioration. The surfaces of his sculptures expose the artist’s process of building up and wearing away, a layering and removing of materials that implies processes occurring over time and depicting the effects of decay, erosion and weathering. 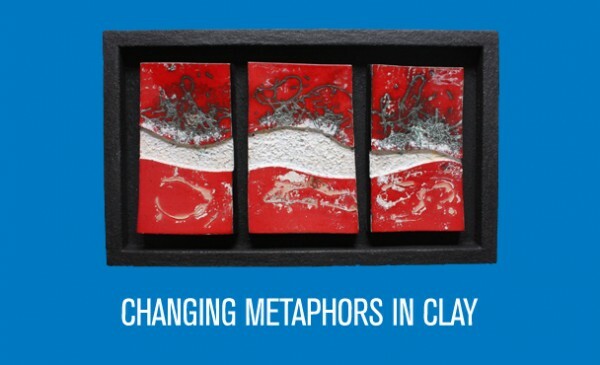 In this exhibition we find interesting work which shows pressed, folded and incised slabs of clay in a kind of compact container, leaving the unusual shape of each piece to retain its original softness and surface texture. Other works express fragmentation, separation, material bursting and exploding and other similar, negative states of the traumatic dimensions of life. Although most of his present work is untitled, the work itself indirectly encourages the viewer to entitle it. Both technical and formal concerns have informed and continue to inform Muscat’s work. His signature forms have evolved slowly over many years as a natural process of working in different techniques and discovering new textures and shapes. Lately he is combining pieces of iron and other metals to his fired stoneware as we find in this exhibition. In his search for new techniques for the manipulation of the primary material of clay, George Muscat will surely achieve more heightened aesthetic appeal in the near future. It is his greatest investment over time and I am convinced that his results will continue to generate great interest in those who have ceramic art at heart.